Russia will present a report on the nationalist Ukrainian National Corps party on the sidelines of the UN Human Rights Council’s, the Russian Foreign Ministry said on Monday in a statement. 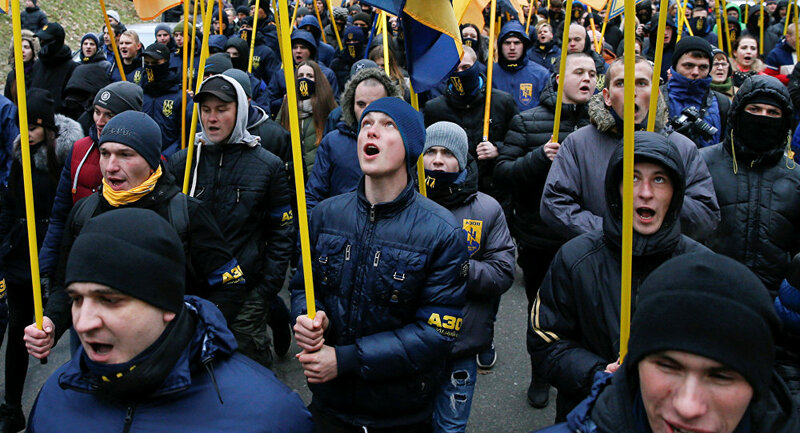 MOSCOW (Sputnik) – Russia will present a report dedicated to the nationalist Ukrainian National Corps party, created on the basis of the Azov Battalion, and its political influence, according to the statement. "The report ‘Azov Phenomenon:’ How Ukrainian Nationalists Became an Influential Political Force’ prepared by the Information Group on Crimes Against the Person will be presented," the statement said. Along with the situation in Ukraine, the UN Human Rights Council will also focus on the situation with human rights in Belarus, Burundi, the Democratic Republic of Congo, Cote d’Ivoire, Myanmar and Eritrea as well as discuss the ongoing Syria crisis, the ministry added. "The Russian delegation will promote development of the constructive dialogue and search for the mutually acceptable solutions on most important issues of the Council’s agenda, [recognition of] inadmissibility of politicization of human rights and using the human rights issue as a tool of political influence," the statement said. The National Corps is a far-right Ukrainian political party founded in October 2016, which includes members of the Azov Civil Corps non-governmental organization, Azov Battalion regiment veterans and volunteers. The Azov Battalion regiment was widely accused by the eastern Ukrainian militia of committing war crimes during the military conflict in the region of Donbas.